As one of the most exciting and innovative scientific achievements to date, laser technology is being utilized throughout the health care community. Dr. Poulos uses one of the newest lasers to treat sun-damaged skin, facial wrinkles and scars in a procedure called laser skin resurfacing. The word “laser” is an acronym, which stands for Light Amplification by the Stimulated Emission of Radiation. A surgical laser, such as the CO2 laser, is a beam of light capable of removing unwanted tissue, such as scarred, lined, wrinkled and otherwise imperfect skin. The laser beam is absorbed by water in these cells. Laser light penetrates to a very precise, controlled depth, making the procedure safe and predictable, while reducing the risk of scarring or pigmentation problems. As a result of this treatment, you can achieve a more youthful looking skin. 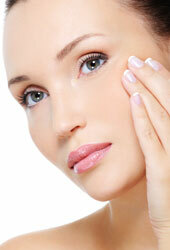 The laser is used to reduce wrinkles, acne scars and other minor skin imperfections. It can improve sun-damaged and acne scarring that often cause concern to both men and women. Laser resurfacing can be used as an alternative to chemical peel and dermabrasion. Prior to your treatment, Dr. Poulos will discuss the goals for facial improvement. After determining the most appropriate procedure to use, we will fully describe the procedure, what results to expect. The skin is usually pretreated prior to surgery to maximize the results. The initial redness fades in a few weeks to a light pink, which can be camouflaged with cosmetics once Dr. Poulos gives you approval. The goal of laser resurfacing is to enhance facial appearance. Dr. Poulos will discuss risks, benefits, and expectations during your cosmetic consultation.